Brookfield Asset Management Inc. is in early talks for an investment in Dubai property developer Meraas Holding, according to people with knowledge of the matter, in a deal that would signal a vote of confidence in the emirate’s ailing property market. The Canadian firm is weighing options that would give it control of some retail properties from Meraas, including entering into a joint venture for those developments, the people said, declining to be identified as the deliberations are confidential. Brookfield is considering taking a stake in the state-run conglomerate as part of such a deal, they said. The discussions are in preliminary stages and may not result in an accord, they said. Representatives for Brookfield and Meraas declined to comment. Besides developing commercial and residential properties around Dubai, Meraas has also invested in attractions such as cinemas, hotels, restaurants and entertainment parks, as well as a health-care venture and projects like the Dubai Cruise Terminal. The firm’s Chairman Abdulla Al Habbai was appointed last year as chairman of Dubai Holding, one of three main state holding companies in the emirate. Brookfield, one of the world’s largest asset managers, owns very little property in the Middle East. It’s in the middle of developing an office tower in Dubai known as ICD Brookfield Place. 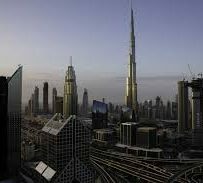 Dubai, which has evolved in recent decades from a fishing village into a hub for finance, trade and tourism in the region, has seen its economy take a hit by the rout in oil prices. Occupancy in its malls have eased as high spenders from neighboring Gulf countries tighten their belts while expatriates threaten to return home and the stock market posts its worst performance in a decade.